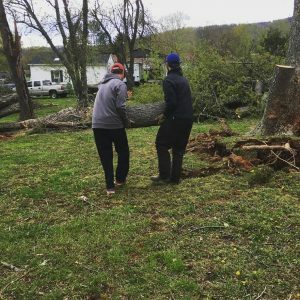 After an EF-2 tornado struck Central Virginia on April 15, the Lynchburg College community sprung to action, helping with relief efforts. Minutes after the tornado hit, devastating portions of Campbell County, the City of Lynchburg, and Amherst County, Lynchburg’s varsity baseball team met to figure out how they could help. By the following afternoon, about a dozen Hornets, led by assistant coach Jeremy Sink, were in Amherst County. In the hard-hit community of Elon, the team cleaned up debris and salvaged family heirlooms. In one case, a lost military uniform was returned to its owner. “It just showed the sense of community that we have here at Lynchburg,” pitcher Noah Winslow ’20 said. Members of the baseball team help with tornado cleanup in Amherst County. The varsity softball team also pitched in, donating items toward storm-relief efforts. “We collected items as a team and we also went out to Walmart to purchase supplies we knew some of the families needed,” head coach Dawn Simmons ’97 said. Simmons added that team member Stephanie Hogan ’20, who is from Amherst County, identified some of the families in need and delivered supplies with her family. Thirty-three students from the College’s Greek life organizations — specifically, members of Sigma Nu, Sigma Sigma Sigma, and Alpha Chi Omega — volunteered to help with tornado-relief efforts in the City of Lynchburg and Amherst County. Dr. William Wells, principal of Amherst County High School and a 2014 graduate of Lynchburg’s Doctor of Education in Leadership Studies program, said the volunteer effort actually began in March. That was when Cameron Short ’21, an Amherst County High School graduate and member of Sigma Nu, contacted him about service opportunities at the school. According to Dr. Wells, Short reached out to Sigma Nu member Sam Wilkins ’19, who organized the relief effort. On April 29, the students fanned out, some working in the Link Road area of Lynchburg and others in the Elon and Wares Gap communities of Amherst County. They cleaned up debris, recovered lost belongings, and donated food, clothing, and $170 in cash to local nonprofit Gleaning for the World for their relief efforts. Lynchburg College held its annual Give Day on April 18, three days after the storm. During the event, members of the Lynchburg family were given the opportunity to designate donations for tornado relief. Nearly $10,000 was collected for this purpose. About $1,000 of these funds were used by Lynchburg’s chapter of Mu Iota Alpha Phi Omega, a coed service fraternity, to buy essential items — diapers, hygiene products, cleaning supplies, etc. — for families affected by the storm. The items were given to Gleaning for the World for distribution. The College is currently working with area nonprofits who are serving those most affected by the storm to distribute the remaining Give Day funds.